"My family of 4 goes through a double batch of this salad and vinaigrette in 2 days. We love it! You can use kidney, garbanzo, or pinto beans in place of lima beans, if desired. You can use pear or grape tomatoes instead of cherry tomatoes, if desired." Combine olive oil, rice vinegar, sherry vinegar, mustard, 1/2 teaspoon sea salt, and 1/4 teaspoon black pepper together in a jar. Place a lid on the jar and shake until dressing is well-combined. Let sit at room temperature until flavors blend, at least 30 minutes. Place edamame in a saucepan and cover with water; cook over medium-high heat until water just begins to boil and edamame is tender yet still firm to the bite, about 5 minutes. Drain and rinse under cold water. 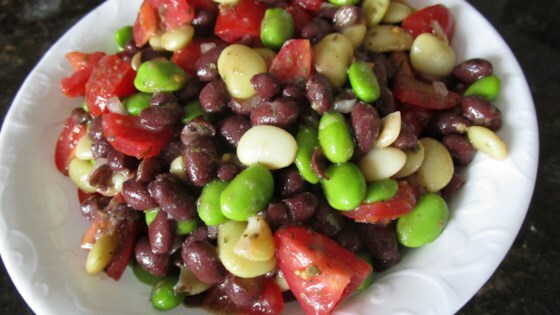 Stir black beans, lima beans, edamame, onion, basil, feta cheese, and tomatoes together in a large bowl. Pour dressing over the top and toss to coat. Season with sea salt and black pepper and refrigerate until chilled, at least 30 minutes.